This winter’s fashionable high-heeled boots put women at risk for slips, falls, and injuries on ice and snow, warns Denver area foot and ankle surgeons Dr. Keith Naftulin and Dr. Adam Toren. These popular boots typically feature tall, spiked heels and narrow, pointed toes. “Wearing high-heels makes you more unstable when walking or standing on dry surfaces, let alone slippery ones like ice or snow,” says Toren. “A stylish low-heeled winter boot is a lot more fashionable than a cast and crutches.” Toren also recommends women scuff-up the soles of new boots, or purchase adhesive rubber soles, to provide greater traction. 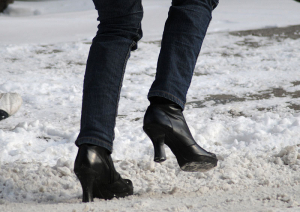 Falls from high-heeled winter boots can lead to a number of injuries, depending on how the woman loses her balance. If her ankles roll inward or outward, she can break her ankles. If her ankle twists, ligaments can be stretched or torn, causing an ankle sprain. According to the American College of Foot and Ankle Surgeons consumer Web site, FootHealthFacts.org, broken and sprained ankles can be present at the same time. Toren and Naftulin are part of 6,000 ACFAS members. 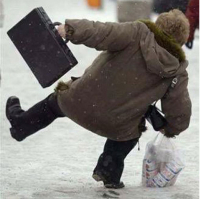 Naftulin urges women hurt from slips and falls in high-heeled winter boots to contact their office at 303.932.7957 for prompt evaluation and treatment. In the meantime, immediately use the “R.I.C.E.” method – rest, ice, compression and elevation – to help reduce swelling, pain and further injury.